Another day, another museum beginning with F. This one's at Woolwich Arsenal, which I blogged about so comprehensively earlier in the year that I wasn't sure there was anything left to see. But there was still this repository of death and killing, so I went there. It's a favourite venue for young children, obviously, one of whom I ended up queueing behind for a ticket. "He's four", said Dad, nodding towards the admissions charge list to the side of the till. "Yes I'm definitely not five, I'm really only four, it's not my birthday for ages," added the small boy, protesting rather too much. But he got in scot-free anyway. 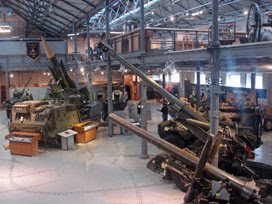 The museum's in two parts, on opposite sides of Number 1 Street, with the main collection housed in a large two-storey hangar. Downstairs are a heck of a lot of guns and wheeled weapons, but don't start there, start upstairs. The entire history of British artillery is laid out before you, including a few missable panels about battles and who beat who. I was more interested to discover how Britain led the world in ballistics, targeting its firepower with increasing accuracy to gain the advantage in campaigns from Napoleon to WW2. And less interested in the minutiae of gunners' uniforms over the ages (was it strictly necessary to provide labels announcing "size 8 trainers" and "women's warm weather slacks", eh?). Quickly, back to the big guns instead, made all the more atmospheric by the sound of rocket fire and shelling thundering away in the background. A lot of young men in uniform, mostly camos, were wandering around the museum. I think they had an office somewhere, and I guess they were volunteers from the nearby barracks helping out with stewarding and running activities and drinking coffee in the café. The museum seemed very keen to promote their in-house catering facility, which is open to folk off the street as well as to paying visitors and soldiers. But, not being much of a café-frequenter myself, I left the museum thinking I hadn't seen much. Partly my fault for being on a whistlestop schedule. If I'd hung around an extra half hour I could have looked inside the medals gallery upstairs, and if I'd hung around an extra hour I could have watched the 'introductory' film and the special audio-visual smoke-and fire presentation. But I'd have had to wait several months to explore the second half of the museum - the Cold War Gallery across the street, because it's currently closed for storage purposes. So I'd recommend that you save your money and come back in 2010... unless you can persuade the nice lady on the front desk that you're only four. To get from Woolwich (above) to Thamesmead (below), you could take the bus. But I walked. It only took an hour, and meant that I got to walk a blissfully obscure section of the riverside Thames Path [map]. Blimey, do people actually choose to live on the eastern banks of Gallions Reach? Maybe it's more attractive when the sun's out. Onward past an expanse of bleak undeveloped wasteground where some future Mayor of London might one day build the Thames Gateway Bridge. 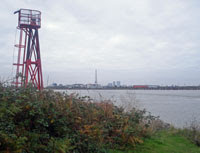 To the remote extremity of Tripcock Ness, where a navigational light-tower keeps guard over a sharp kink in the Thames (highlight of the walk, in a flat grey way). And on east towards Thamesmead Clock Tower, which was much harder to reach than it first appeared. On the riverbank I discovered an extraordinarily over-optimistic example of urban planning - a raised concrete viewpoint (with a view of, erm, Barking Reach flood barrier, some incinerators and big piles of rusty containers) plus thirty-or-so landscaped benches (some with a view of the aforementioned Dagenham shoreline, others staring straight into a brick wall). And all for a usership of nil, because nobody ever got round to building flats on the strip of wasteland behind. Obviously I loved it. And I'll be back to do this walk properly, in its entirety, in sunshine, one day. When you live on a reclaimed munitions testing site in the shadow of a sewage works, a trip to the shops could really brighten your day. 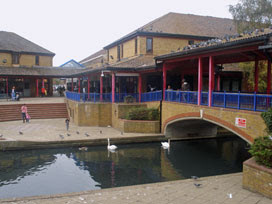 But for the fifty thousand residents of Thamesmead, the local town centre leaves much to be desired. Forty years ago things seemed very different. A bold futuristic 'floodproof' town had been constructed on the Erith marshes to rehouse London residents displaced after slum clearance. It must have seemed ideal to locate the shopping centre non-centrally on a lakeside near the Thames, even though this meant that most residents would have to drive or catch a bus to get there. And it must have seemed ideal to build shops on either side of an artificial canal beneath a giant Clock Tower, all to add a bit of character. Alas, the place doesn't feel quite so ideal now. Most shoppers arrive by car. There's a huge car park (hemmed in between the Argos Extra warehouse and the Post Office) where flocks of unflappable starlings fight to peck the meat off discarded chicken wings. Grocery-seekers have a choice of Aldi, Iceland or a rather large Morrisons, while other more highbrow high street names are notable by their absence. Hell, there's not even a Greggs pastry outlet in the neighbouring arcade, which struck me as something of a wasted opportunity. No Starbucks either, but the atmosphere-free Diana Coffee and Sandwich Bar seemed to keep the local caffeine-slurpers happy. Joyce Dawson Way is the canalside parade bit, boasting two betting shops, a fried chicken and fish bar, a tanning lounge, a florist and a large runaround space for dropping your kids off in. Somewhere out the back is an enclosed area once home to Thamesmead Market, now stall-free, open to the skies and desolate. There's also a pub called the Cutty Sark, which scared the life out of me even from outside, but which I noted is fully accessible to alcoholics in mobility scooters. Down by the water's edge a young girl called Kelly was running amok frightening the swans with a whistle, which was almost as loud as her screeching Mum yelling down from the overbridge that it was time for her and her sisters to leave and go home. When overhead bongs from the top of the clock tower added to the cacophony, I decided it was time to follow suit. And if you're wondering where the "Clockwork Orange" report is, the eastern half of Thamesmead (with the concrete-edged lake) is in the London borough of Bexley, so rest assured I'll be back to explore Southmere some other jamjar day.